Globally polar bear populations continue to decline. The United States is home to two distinct populations, of which, both are in decline. The Beaufort Sea population decline from an estimated 1,800 individuals in the 1980’s and 1990’s to 1,500 individuals in 2006. Population numbers for the Chukchi Sea area are incomplete. Persistent Organic Pollutants (POPs) such as PCB’s and mercury negatively influence the health of polar bears. POP’s are contaminants that are slow to degrade in the environment and bond to the fatty tissue that is key to polar bear survival. As the bears utilize their fats stores over the winter this releases the contaminants into their systems causing disruptions in reproduction, thyroid function, and immune systems. They reach the polar bears via the food chain (from plants into fish into seals into bears). 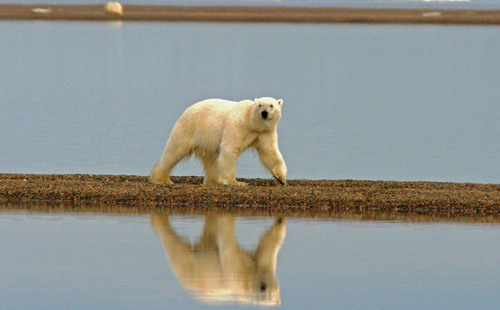 The possible demise of the polar bear is tied directly to the effects of global warming. Sea ice is the key habitat for the polar bear providing dens, hunting grounds, and means of travel. Global warming has an increased effect in the arctic, with water temperatures increasing faster than other areas of the globe. The sea ice acts as a natural reflector to solar radiation. However, warmer temperatures are causing the ice to melt, exposing the darker colored water. The darker water absorbs the solar energy increasing the temperature of the water, thus speeding up the melting of the ice. The loss of summer sea ice will result in the decline of suitable hunting grounds for the polar bear, forcing them to travel greater distances to hunt. Declines in polar bear fat storage have already been seen resulting in stress to the bears and sometimes death. As the sea ice continues to decline this may also push bears inland to human populated areas. The polar bear was the first mammal to be listed as Threatened due primarily to global warming.